If you’re looking for the ultimate convertible experience, look no further. The Phantom Drophead Coupe is a refined, luxury, open-top cruiser that will allow you to enjoy both the fresh air and the sound of a sublime V12 engine. The Drophead Coupe isn’t just a Rolls-Royce Phantom with the roof chopped off. In fact, every exterior panel of this convertible is different, from the grille that slopes ever so slightly backwards, to the boat-inspired teak decking at the rear that covers the hood when stowed away, this is subtly, but totally, different to the Phantom saloon that relaunched the Rolls-Royce marque after its takeover by BMW. The overall look is more streamlined, the impression aided by slim LED side lights and an integrated front bumper, a pair of rear-hinged ‘coach doors’ (as opposed to the four doors of the saloon) and the motor launch-like rear. The interior of the Drophead Coupe has been designed with the possibility of the elements coming into contact with the materials used in the cabin. So, for example, the seats have smooth, ridgeless surfaces in order for any water to be wiped off easily, there are sisal mats on the floor and the carpets are made from materials that can cope with moisture. Elsewhere, the finest-quality leathers and wood veneers are used throughout the cabin, and the hood (the largest of any current convertible), when in place, enhances the luxury feel, thanks to a cashmere lining and five layers of insulation, which ensure that the Drophead Coupe is whisper-quiet. The Drophead Coupe’s driving position is superb: the commanding, high-set position means that there’s plenty of forward visibility beyond the long bonnet, but unfortunately this isn’t matched in the rear, where a narrow back window in the hood and small wing mirrors restrict the view behind. There’s not a huge amount of room in the back either, but it should be enough for adults as long as the journeys aren’t too long. The ‘picnic boot’ opens in two sections, the lower one also doubling as an alfresco seat for two. The boot itself is also large and practical, with a 315-litre capacity, which means it can certainly swallow up all the luggage of a couple taking a trip. The Drophead Coupe is different to the Phantom saloon in one obvious, but major, respect: the lack of a roof, which will inevitably affect the torsional rigidity of the chassis. However, Rolls-Royce claims that this is among the stiffest convertibles around and the complete absence of scuttle shake – along with the tell-tale wobbling of the rear-view mirror – suggests that it has been largely successful in achieving this aim. On the road it feels nicely balanced, even if you’re always aware of the car’s the 2.6-tonne weight. There is a little body roll when you push the car into corners at higher speeds, but it’s very well controlled nonetheless. The steering is a little light, but it’s still accurate and sharp, and it comes in useful when manoeuvring at low speed (parking, for example). The ride is, as you’d expect from a Rolls-Royce, superb, the air suspension more than meeting the task of ironing out any imperfections in the road that might impinge on the car’s occupants. Under the Drophead Coupe’s bonnet is the same hand-built, naturally aspirated 453bhp 6.75-litre V12 engine found in the rest of the Phantom family. The impressive power means it can hit 60mph from a standing start in a mere 5.6 seconds (quicker, by 0.1secs, than the saloon) and the experience of that turn of speed, with the roof down, is guaranteed to raise a smile on anyone’s face. And even when driving normally, the acceleration feels effortless, the refined engine oozing power when in cruising mode, but also as you summon the necessary urge for any overtaking duties. A six-speed automatic transmission also ensures unruffled progress, shifting gears smoothly and seamlessly. There’s no escaping the fact that a Rolls-Royce convertible with a V12 engine is inevitably going to be expensive to run. The official fuel consumption of just 18mpg – which will be a great deal lower in real-world driving conditions – would make most motorists baulk, but the reality of Rolls-Royce ownership is that if you can afford the £332,400 purchase price (and that’s before speccing any optional extras), you shouldn’t have too much trouble stumping up the cash to run it. CO2 emissions of 377g/km are also very high, but the £435 VED will be loose change to a Drophead Coupe buyer. 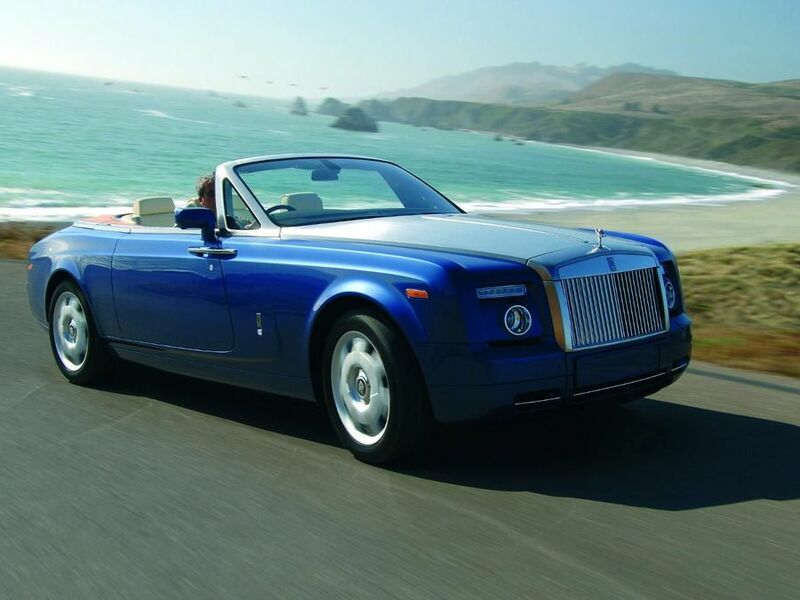 The Drophead Coupe doesn’t sell in large enough volumes to show up in customer satisfaction surveys, and Rolls-Royce owners tend to be sufficiently private and discreet to not make any problems with their cars public. However, it would be surprising if there were any significant problems, as Rolls-Royces are built by hand by highly trained and skilled craftspeople in a purpose-built facility. The main worry, with a lesser car, would be the folding soft-top roof, but the Drophead’s massive hood is likely to be engineered to within an inch of its life, so it’s unlikely to cause any problems. Factor in the tried-and-tested BMW components found in models such as the 7 Series and the overall result is a very reliable car. The very latest developments in safety technology are present in the Drophead Coupe. In addition to the robust and highly advanced rigid aluminium spaceframe, there are crumple zones that dissipate the force of a collision through the chassis and the main understructure (the strongest part of the chassis). There’s also an Intelligent Safety and Information System (ISIS) that takes readings from sensors around the car and, if the car is in an accident, makes 4,000 calculations a second to work out how bad the impact is, triggering safety measures such as the deployment of airbags and pre-tensing seatbelts if it deems necessary. The ISIS also works with active safety systems such as dynamic stability control and dynamic traction control, to avoid getting into too much trouble in the first place. Rolls-Royces are renowned for the extensive equipment available on the options list and the possibilities are almost endless for Drophead Coupe buyers. And in addition to the ‘usual’ list of kit, there is an expanding range of exclusive bespoke items, from picnic sets to gun racks. More conventionally, standard options include a sound system, built with studio-grade components, that uses 15 speakers and a nine-channel amplifier to pump out 420 watts of the crispest, clearest sound you’ve ever heard in a car, from a variety of sources (CD, MP3 player, radio, etc), plus the standard infotainment system based on BMW’s iDrive. Now that the Bentley Azure is no longer on sale, the Drophead Coupe is alone in offering this kind of opulent convertible experience. If you can afford it, it’s the only way to enjoy the open air and a luxury car at the same time.